“The best young player this country has seen for the past thirty years” were Manchester United manager Alex Ferguson’s words on signing Wayne Rooney after he cut a dash on the international stage at Euro 2004. Although he has since been troubled by injuries and an occasional inability to control himself, Ferguson knows his stuff and Rooney has started on a journey that could see him join the elite of international greats if his talents can be harnessed in the right team setup. 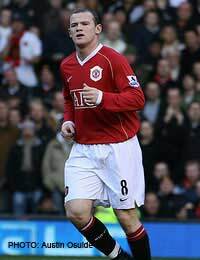 Wayne Rooney started his career at Everton and was slowly introduced into the first team, at the age of sixteen, during the 2002-03 season, as a buzz of gossip spread about his precocious talent. He took his first major record, that of the youngest Premier League goal scorer, with a cracking shot against Arsenal, but this was later surpassed by Leeds United’s James Milner, and then again by Everton’s James Vaughn. More startling goals in the Premier League, and winning the BBC’s 2002 Young Sporting Personality of the Year, meant that then England manager Sven-Goran Eriksson began to take an interest in the boy who was displaying almost unnatural strength for one so young, combined with quick and tricky ball play and a venomous shot. The England debut came as a substitute in a friendly against Australia in February 2003, making him the youngest ever England player, at 17 years and 111 days. This broke a record that had stood since 1879, although a few years later Theo Walcott broke it again. He impressed enough to play in all six of the remaining Euro 2004 qualifiers and, despite some lacklustre results, the team qualified at the top of their group and went into the finals with high hopes. Opinion was divided as to whether Rooney should be held back and used sparingly, being so young, or play a pivotal role from the beginning. The England management team decided to go with the latter and Rooney started for the first match against France, which England were winning through a first half Lampard goal but eventually lost to two goals from Zinedine Zidane in the 90th and 94th minutes. In the next match, Rooney scored two goals, making him the youngest ever scorer at a European Championship. Once more this was short lived, as a Swiss player broke that record against France four days later. This performance, and a further two goals against Croatia to cement England’s passage to the quarter-finals, focussed the world’s sporting media on the boy wonder, and everyone was waiting to see what happened in the quarter-final against hosts Portugal. Unfortunately he was injured and had to come off after half an hour, and England went out on penalties, but the officials were impressed enough to vote him into the All-Star Squad for the tournament and he came second to Frank Lampard in the UK Player of the Year award. Inevitably, after such an attention-grabbing display, the summer was spent with the Premiership’s big guns fighting for his signature, after Everton confirmed that they couldn’t meet his wage demands. Although Newcastle United came close, it was Manchester United that won the race with a transfer fee eventually likely to exceed £31 million (if all the bonuses play out) making Rooney the most expensive teenage footballer ever. There was now no question of ever leaving a fit (or suspension-free) Rooney out of the England team and the next tournament would be the 2006 World Cup in Germany. Although England qualified top of their group it was only by one point, and significant scares happened along the way. The low point was undoubtedly defeat by Northern Ireland, a game in which Rooney was lucky to stay on the pitch and had angry exchanges with captain David Beckham. Despite this hopes were again high going into the finals although a tackle by Chelsea’s Portuguese full back Paulo Ferreira had broken a bone in Rooney’s right foot. Battle ensued between the FA and Manchester United as to who would decide when he was fit enough to play, and in the end he missed the warm-up friendly and the first game of the group stage, a turgid match settled by an own goal in the opening minutes by a Paraguayan defender. More fluid displays saw the team, with Rooney back in play, qualify for the knock-out stages but there was disquiet about the coherence of the side and under-par individual performances by many of the Premiership millionaire set. A better performance to put out Ecuador in the first knock-out round set up a quarter-final against Portugal, which would prove another big game for Rooney. Unfortunately it was a big game in the wrong way, as Rooney’s short fuse was by now well known and the Portuguese defenders and midfielders were doubling up and niggling away at him. The inevitable flare-up occurred in the 62nd minute, with either team yet to score. In a tangle with Carvalho and Petit, Rooney (apparently accidentally) stood on Carvalho and as the Portuguese players rushed the referee, Rooney pushed his United team-mate Cristiano Ronaldo and was sent off. The game remained score-less, England lost the resulting penalty shoot-out and were once more on the plane home too early. Rooney missed much of the disastrous qualification campaign for Euro 2008 though injury, particularly the final nail-biting games. He was back for the qualification campaign for the 2010 World Cup and although concerns were raised over a relative lack of goals for England, this denies his valuable contributions that make space and goals for others, even when operating as lone forward. In any case his touch for goal returned under Fabio Capello when he scored over a third of England's twenty-eight goals. The campaign saw England take the top of the group with a six point gap with a better performance on paper than any other team in Europe bar European Champions Spain. And although concerns are still voiced over his temperament, it has improved. It doesn't look as likely that he will go down the same road as Paul Gascoigne, something that many pundits were worried about at the beginning of his career. It is certainly true that when fit, Wayne Rooney is the most skilful player in the current national side.